I didn’t do very many of these Eyelet Buttonhole flowers, I love how they look but I realy do not enjoy doing Bullion stitch…On the few I did do I tested out different thread types…The dark pink flower is a fine silk thread, the light pink flower is a soft cotton pearl twist thread, the gold flower is a Rayon Pearl twist thread. On My Box top I did a cluster of 3 eyelet buttonhole flowers and finished them with detached chain stitch leaves. 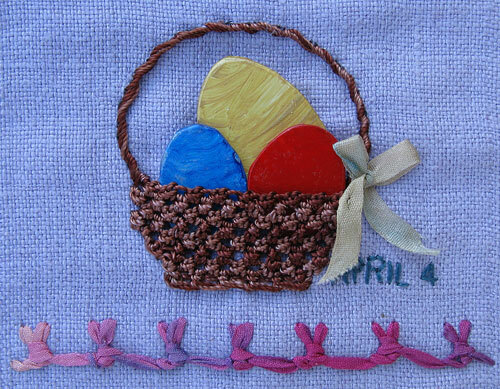 or Easter I used the knotted buttonhole stitch as a needle weaving fill to make a basket….I cut the eggs from a CD, drilled holes near the bottom to stitch them on below the line of the basket and painted them with acrylic paint. below is knotted buttonhole stitch on done on my boxtop. For the second band I added 2 extra buttonhole stitches to each step. For the third band I added 2 extra bottonhole stitches and flop flopped the stitches from side to side. For the fourth band I did the buttonhole stitches in clusters of 3 before looping them together. The change of background colour is for the change of the month. For the fifth band I added the extra 2 buttonhole stitches and flip flopped the stitches so that they also topped and tailed along the line. The last band is the basic stitch flip flopped, with the stitches topped and tailed. 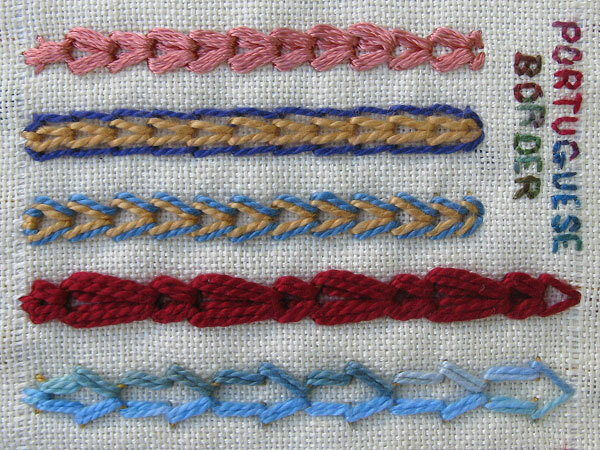 These are my Portuguese Border stitch Variations. The third band is what I was trying to do in the second band but instead of doing the second colour nwxt ot the first colour I found that I had to put the needle over and then under the thread of the first colour (see image below). 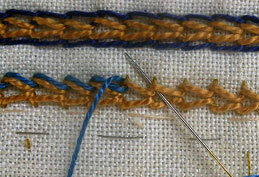 The third band has the foundation stitches with alternating narrow and wide spaces (see image below). for the bottom band I did alternating foundation stitches as 2 smaller stitches. To use this stitch on a crazy quilt I have done it on a Beret that is a slow work in progress. 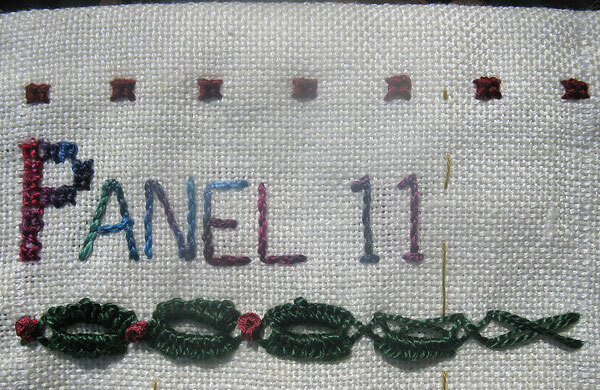 When I was starting this Panel a friend showed me sorbello stitch so I used it to hold down the hem of the panel and to stitch the P of panel. 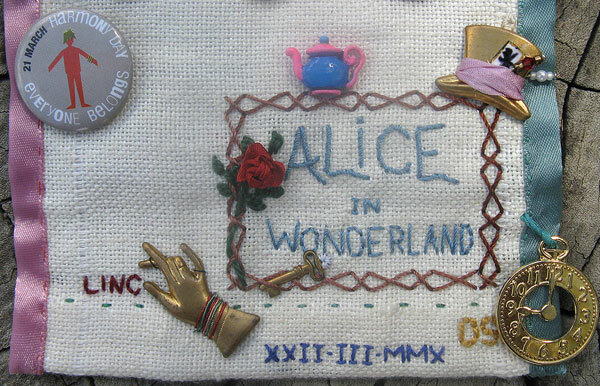 I did this detail after seeing the 3D Alice in Wonderland…I used the setup stitch for beaded Hedebo edging as the frame, I painted the Teapot Pink and Blue and used pins and beads to make hat Pins for the Mad Hatters Hat. LINC is for Living in networked community, a supported independant accommodation program that my daughter has applied for, the interview went well and all I can do now is cross my fingers. 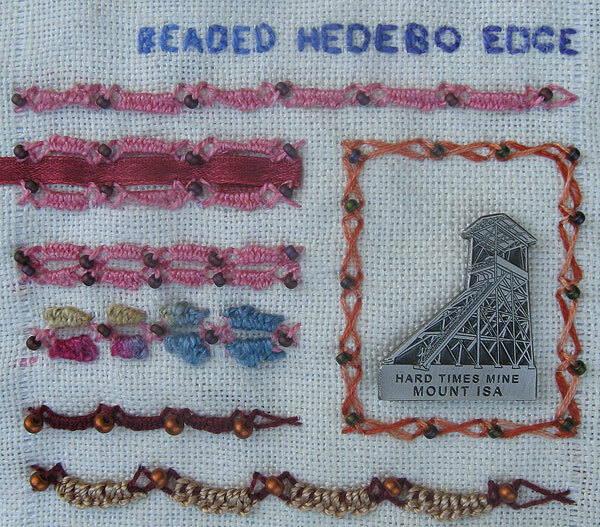 These are my first Beaded Hedebo Edges. Every time I do the base of cross stitches for this stitch I think how pretty it is, so when I used it as a frame I added only the beads to it. 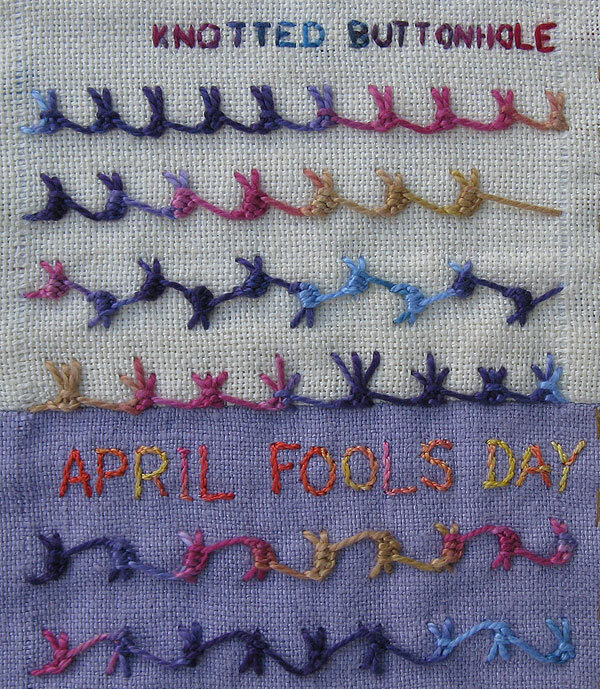 Again after doing variations of the stitch that seemed obvious to me I had a look around the blogs linked to Sharon’s comments and found a few ideas that I liked. I found the top detail on Doreen’s blog. 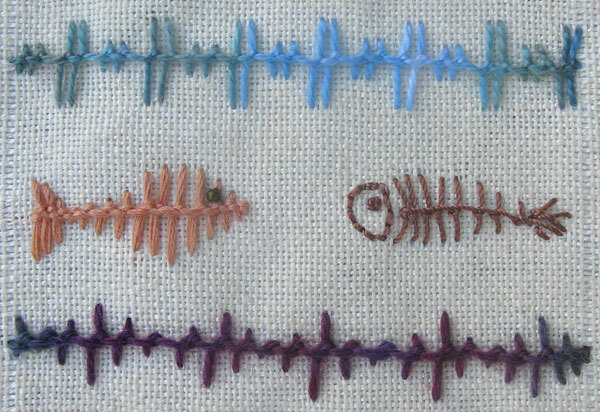 I found 2 Blogs who saw fish in the knotted loop stitch and was interested in how differently they used the stitch to make there fish skeletons. both stitchers have also used the knotted loop stitch to make seaweed with there fish. I saw similar variations to the bottom detail on several blogs and it is the variation that I have used on a crazy quilt. The Bird on the Mountain could well be to represent the Sculpture of a bird on his nest at the Arboretum(great sculpture made out of old rusty metal car bits and tools), but its not, what looks like a mountain was supposed to look like my roof,off in the distance, just pocking out above the trees and the Bird on My roof is to represent Bird Roofing Restorations who restored my roof last week. 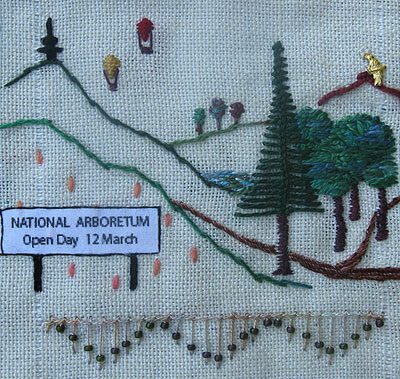 The detail at the bottom is Knotted loop stitch with beads added. The little bit at the top is a last diamond stitch because I wanted to see how it would stitch with Metalic thread. The first Row of Knotted Loop Stitch is the basic stitch done in a size 5 cottojn pearl thread. The second row, done with a soft thick cotton thread, forms curves down each side by altering the length of the stitch. Leaves is an obvious use for knotted Loop stitch. On the 10th of March a third baby elephant was born in Australia, this little guy, nick named Mr Shuffles is kinda special, thought to have died in in the womb only to be born alive and now after a shaky start is doing well…I have used knotted loop stitch to frame his photo. The bottom row is the thick soft cotton thread with one straight side and one shaped side making it look like a fringe.